What is it about bundts? For me, the fun of this type of pan is the swirl you can make inside the cake. So when the founders of our monthly bundt group, Anuradha of Baker Street and Lora of Cake Duchess, decided that our June theme would be swirly bundts, I was all in. I've swirled before, even when it wasn't part of our challenge, but Murphy's Law stepped in this time. My first attempt was a complete, although tasty, failure but I'll tell you about that another time. Today let's focus on the success and complete peanut buttery deliciousness of this properly swirled cake. The chocolate batter has a good, deep flavor without being tooth-achingly sweet and the peanut butter batter compliments it well. This cake makes for a great morning treat with coffee or a cup of tea. Enjoy! In one small bowl, combine 1 cup of flour, 1 teaspoon of baking powder and 1/2 teaspoon of baking soda. Do the same in a second small bowl and add the cocoa powder to that one. In a large bowl, cream together the sugar and eggs. Add the butter and continue beating. Add the water, vanilla and salt. Divide the mixture evenly into two bowls. Add the peanut butter to one bowl, beat until smooth and fold in the first bowl of flour, baking powder and baking soda. To the second bowl, fold in the flour mixture with the cocoa powder. Butter and flour a 12 cup bundt pan. Add half the peanut butter batter to the pan, followed by half the chocolate batter, followed by the second half of the peanut butter batter and topped off with the final half of the chocolate batter. Using a butter knife, gently swirl the batters together but do not over mix. Bake in a pre-heated 350 degree oven for 50 minutes or until a cake tester comes out clean. Allow to cool very well before removing from the pan. Makes approximately 10 servings. - Follow Bundt-a-Month on Facebook at http://www.facebook.com/BundtaMonth where we feature all our gorgeous bundt cakes. Or head over to our Pinterest board at https://pinterest.com/bakerstreet/bundtamonth/ for inspiration. Aha! So that's the secret to swirling pb and chocolate to absolute perfection! As always, Anita, your cake looks scrumptious! Girl, your swirl looks perfect! Your swirl is simply perfect!! Peanut butter and chocolate are natural partners and this cake sounds amazing. Darn it. Now I can't focus the rest of the day because I'll have this cake on my mind. This cake looks great and the swirls are beautiful!!! I pinned this so I can use your recipe the next time I attempt one. . chocolate and peanut butter is probably my 2nd fave flavor combination. . can't go wrong with chocolate and peanut butter. Ever!! yum! This is a perfect swirl indeed and the next time I swirl it will be with your method. You nailed this one! Look at the swirl! It's the best swirl ever because it has peanut butter and chocolate! Made bundts all the time but never a swirled one.. need to try this out. Chocolate and peanut swirled together...heavenly!! OK... after careful consideration, I think I'm gonna have to jump onto the #BundtAMonth bandwagon. This looks SO fun! Your cake makes me want to do a face dive right into it! You know how I feel about chocolate & peanut butter! Great combination of flavors and your swirl turned out so well! I like the idea of doing 1/2 of each batter twice rather than just once layer of the swirl batter. I'll try that next time. How did you do it, Anita? It must be magic. I don't think I'll ever be able to swirl as perfectly as this. It wouldn't matter because chocolate and peanut butter is one of the best combinations in the world so who cares what my bundt looks like? It's all about the taste, baby, and my mouth is watering looking at your photos! 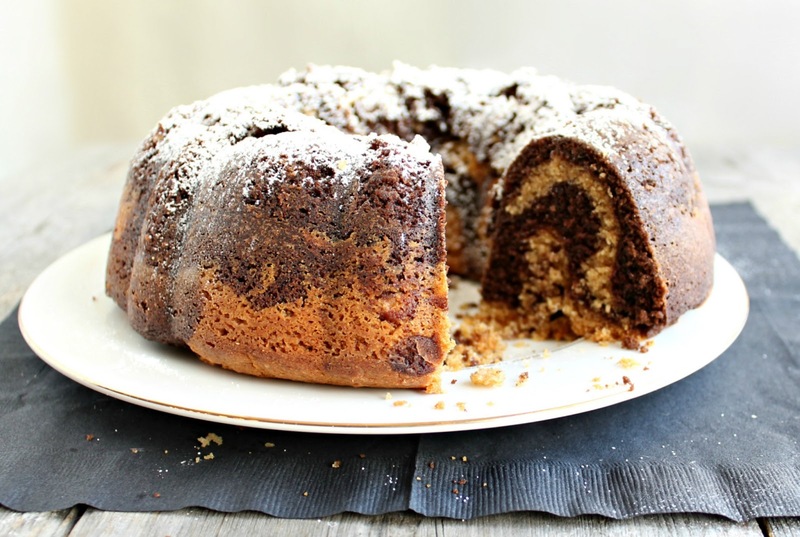 I love it when my blogger friends post their bundt cakes each month! this looks so good! I don't think I have ever seen a more perfect swirl, Anita. No kidding. And if there is a better match for chocolate than peanut butter, I don't know what it is. I love a swirly bundt! This looks amazing! Love to make bundt cakes as they are the easiest to cut and make last and usually they are the moistest. Thanks for sharing. I have not mastered the art of swirling...but it is good to know that even a pro has trouble once in a while. Glad your second attempt turned out som beautifully! Chocolate and peanut butter--a classic combo! Very nice swirl! I'm definitely going to have to make this one for my husband...he's a PB and chocolate fiend! This looks amazing. Beautiful Anita! 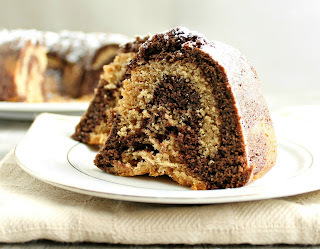 Chocolate and peanut butter cake swirled or not I'm there! Thanks for sharing at Foodie Friends Friday Sweet Treats Party! Chocolate and peanut butter are the only 4 words I need to hear! Yum! this looks almost too beautiful to eat! almost! you sure know how to get my attention girl! I should tell you I fried food tonight just to get back at you for not sharing any of this cake with me! It's ok, at least now I've got the recipe so I'll forgive you. I'm featuring this at Thursday's Treasures, can't wait to see what you share next! This looks delicious! Thank you for sharing on Thursday's Treasures. I'm thinking about joining this month. I've featured this on Week 90. Please stop by and grab my featured on button. Have a lovely week! 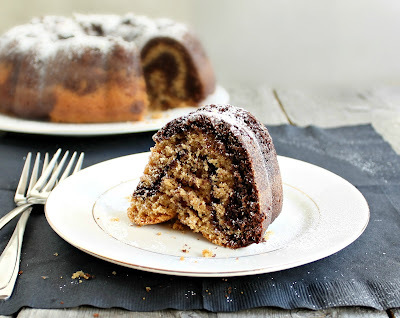 I'm making this for my neighbor this weekend, awesome, thanks for sharing, I think I accidentally entered your linky party, I thought any bundt cake could go but I just read it should have berries in and mine doesn't so feel free to remove it, I understand it doesn't fit your requirements. Sorry. What a delicious Swirl Anita, it looks great. Just made it, came out very good, even the swirl. It was not too sweet but tasty. I put a chocolate peanut butter ganache on top to sweeten it up.